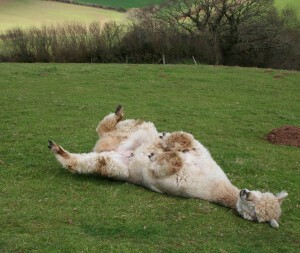 Oh how wonderful, a spring morning at last. 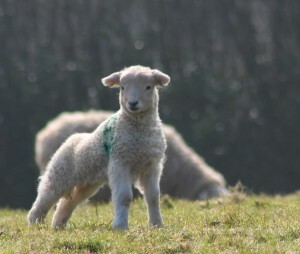 Sun warmed my back for the first time today, as I climbed the hill as usual with the dogs to check the ewes and lambs and feed our shy visitors. Slowly the valley is awakening. As the first day of Spring arrived the rain did stop for a while, even the sharp north wind dropped briefly, fooling us that winter was behind us. But, alas, it was to be just a temporary reprieve; storms, gales, icy rain and sleet returned battering their way through Easter holidays and beyond. As waterlogged fields begin at last to drain we wait anxiously,well into April, for signs of new grass to appear up the valley. 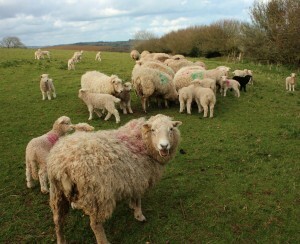 We need it badly to feed hungry ewes and lambs. Maybe today will really be the start of Spring. The sky is full of birds busying about, shouting greetings to one another, house hunting furiously for a suitable place for this year’s family. 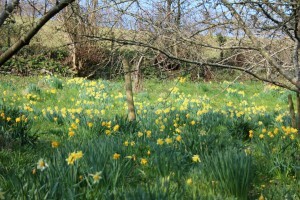 The hedgerows are thickening and the orchard is a mass of yellow, a host, indeed, of golden daffodils. All so uplifting after such a long wet, muddy winter punctuated by violent storms and endless dark grey days. And, have you noticed, as the sun shines people begin to raise their faces from the ground, smile and greet one another in the street. 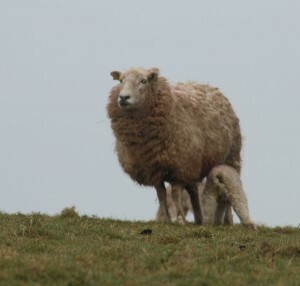 We lambed just thirty sheep this year; twenty-five pedigree Whiteface Dartmoor’s plus five cross-breed ewes, old timers we can’t bear to lose! 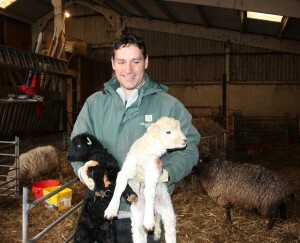 We have thirty-four lambs including eight sets of twins, a record for us. All are grazing with their mothers in Sunday Orchard, the huge field just beyond the yard. We will continue to feed them until the grass finally begins to grow. 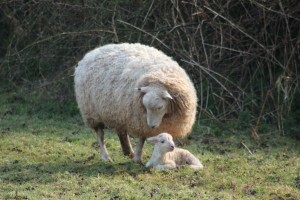 Each year we bring the ewes into the big shed in the farmyard for two or three days after they have lambed. 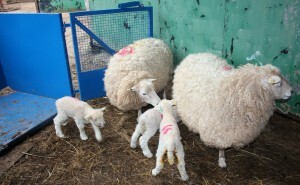 The babies are tagged, their numbers recorded and their tails docked. They stay in the nursery until we are sure all is well and they are strong and feeding. Then with Gheorge’s help Paul moves them up the hill to pastures new. They are loaded into our smart new stock box and driven up in batches to a south facing field. The babies soon begin to bounce and spin in the sometime-sunshine, playing in little groups watched over by the ewe on playgroup duty. Much time can be lost just standing and watching them play. Rams rest up on the hill, their work complete while wethers eat quietly in another field until they go to market. Today we will be selecting out a group to go to the local abattoir from our regular customers. Paul will take them there later this week, early in the morning. They will be dispatched immediately to avoid distress. Not only is this humane but also prevents a build-up of adrenalin in the meat. 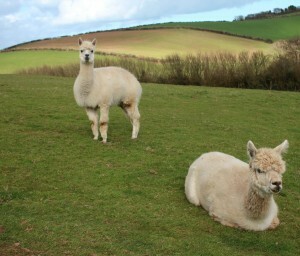 Our local butcher, Richard Pollard of Pollard’s Quality Meats in Dartmouth, will then collect the carcases. He will hang them for a week before butchering them to each customer’s requirements. Hogget has a rounder deeper flavour than early lamb, the meat rich and dark. And contrary to popular belief it is not at all fatty like our erstwhile images of grey, fatty school dinners; well mine anyway!! 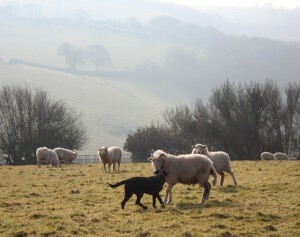 Indeed, Hugh Fearnly-Whitingstall waxes lyrical about hogget in his wonderful River Cottage Meat Book, and he’s right! So this afternoon’s boys will have had a short but happy life and go on, in a small way, to feed the nation, which, after all, is a farmer’s job. 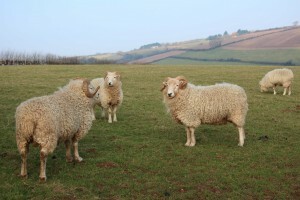 We breed our stock to improve the blood line of our breed and to provide food for our discerning customers! The cycle continues. At last the rain may have stopped but I fear, only briefly! So I need to cook comforting food to restore my equilibrium, but it must be light delicious summer food. Somehow I think it better be Hogget! I’ll roast a shoulder with garlic and rosemary and serve it with young vegetables, some potatoes and mange tout peas perhaps. Or I’ll take a little more time and pleasure to prepare a traditional Navarin Printanier based on a recipe from my old copy of Jane Grigson’s wonderful “Vegetable Book”. This is not a dish for stewing lamb. It calls for tender, lean meat which will cook gently but quite quickly. I prefer to cut up a shoulder or even use a boned out loin. Take a little time to trim off any fat and sinew before cutting the meat into fairly small pieces. Melt a large piece of butter and a little oil in a heavy oven proof pan that has a well-fitting lid. Incidentally, the oil stops the butter burning and becoming bitter. Brown the meat quickly turning it over with a wooden spoon until sealed. Then take it out and set aside. Return the browned meat. Heat gently, adjust the consistency, which should be creamy, by adding more stock if necessary. Bring slowly to the boil, cover the pan with its lid and place in a moderate oven for about an hour. Test the meat with a skewer to see if it is tender. If not return to the oven for a little longer but don’t overdo it. Meanwhile prepare some young fresh root vegetables; new potatoes, very young turnips and whole baby carrots. Once the meat is tender add these and cook for a scant half hour without the lid. Top and tail some mange-tout or shell some peas and broad beans, slice your first runner beans or harvest the early French beans; use what you have in your garden or what you can find in your local farmer’s market.